Cyclists may legally be able to go through red traffic lights under plans being considered in London. 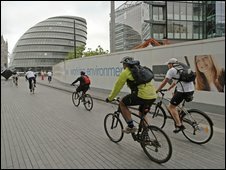 More than a third of fatal cycling accidents in London involve cyclists being hit by heavy vehicles turning left, Transport for London (TfL) said. Its plan would enable cyclists to turn left through a red light before other vehicles can move, without being fined. Cycling group CTC welcomed the idea "if there was a way in which it could be done by meeting pedestrians' needs". Last year nine of the 13 cyclists killed on London roads were hit by heavy goods vehicles (HGVs) and all four cyclists killed in the city so far this year were hit by HGVs. A TfL spokesman said: "We are looking at the possibility of allowing cyclists to turn left through a red traffic signal while general traffic remains stationary, which could potentially reduce the number of collisions involving cyclists struck by other vehicles turning left." He added: "Trials have recently been given the go-ahead in Strasbourg and Bordeaux and we will be following and reviewing the outcomes of these trials closely." TfL is considering the plan as part of a £111m scheme to "improve conditions" for cyclists. A Department for Transport spokeswoman said a change to legislation would be required to enable cyclists to pass through red lights without incurring the current £30 penalty. "This would need to go through the appropriate Parliamentary processes before it could take effect," the spokeswoman said. TfL has not yet submitted its proposal to the Department for Transport.